Upon walking in the lobby it was very apparent that this hotel had an artistic flair to it. The lobby and bar featured various paintings on the wall, bright red accents in the decor, and fun wallpaper. This entire trip to MIA Fest was last minute, and although the hotel search was getting scarce with a handful of rooms selling out, my friend @Beedurst found an amazing room! Although our room was not ready for us when we arrived, they offered us free drink vouchers for the bar, which 100% made up for the wait. After traveling all day some cold wine sounded amazing. Sonesta Philly’s location was only a five-minute drive to the concert venue of Benjamin Franklin Parkway. It was hot as balls the entire weekend so we were very ecstatic to be close to an air-conditioned room. Once we were in the room, it was apparent that the artistic feel carried its aesthetic into the interior of the hotel room. Our room opened to a spacious living room that had a bar against a wall, a view outside, and fun pieces like the cowhide chair. The bedroom was also a great size and had an artsy half wooden half cushioned couch. I had my Kate Spade brunch pajamas with me, which called for some photos of course! Although the pajama gown called for “Cake for Breakfast” across the gown in pink letters, I chose an eggwhite omelet. Sugar in the morning for me comes strictly from my coffee. Although this pajamas dress is an oldie from Kate Spade, I am currently loving their watermelon themed pajamas! 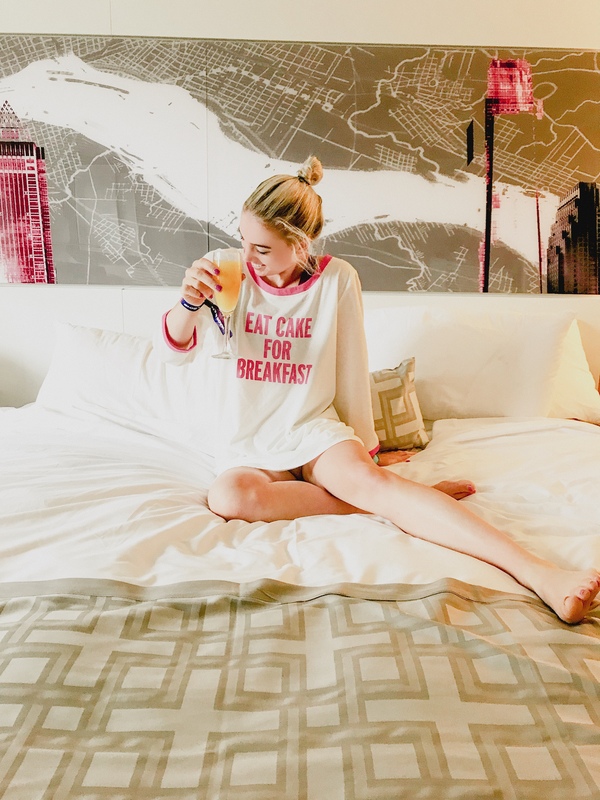 Mimosas in the air called for a cheers dedicated to an amazing weekend with MIA Fest, and a comfortable stay at Sonesta Philly.